Kosmos 186 und Kosmos 188 waren Sojus-Raumschiffe, die am 30. Oktober 1967 die erste automatische Kopplung der Raumfahrtgeschichte durchführten. Kosmos 186 (Russian: Космос-186 meaning Cosmos 186) and Kosmos 188 (respectively, Cosmos 188) were two unmanned Soviet spacecraft that incorporated a Soyuz programme descent module for landing scientific instruments and test objects. 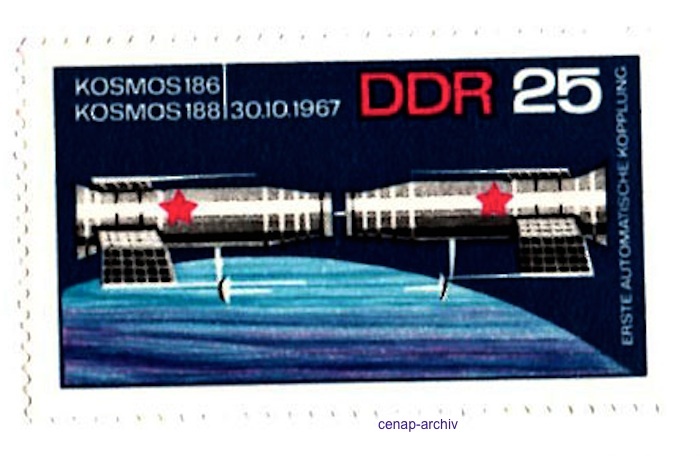 The two USSR spacecraft made the first fully automated space docking in the history of space exploration on October 30, 1967. Mutual search, approach, mooring, and docking were automatically performed by the IGLA-system on board Kosmos 186. After 3.5 h of joint flight, the satellites parted on a command sent from the earth and continued to orbit separately. Both made a soft landing in a predetermined region of the USSR - Kosmos 186 on October 31, 1967 and Kosmos 188 on November 2, 1967.